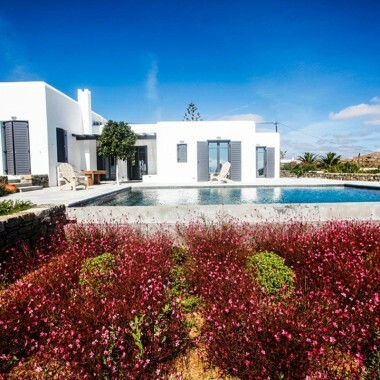 This charming and luxurious modern rental villa on Mykonos is located in one of the most privileged areas of the island, protected from the winds, and with breathtaking views of Mykonos town and the Aegean sea. Agios Stefanos beach is just a 3 minute drive away, and Choulakia beach is 7 minutes. 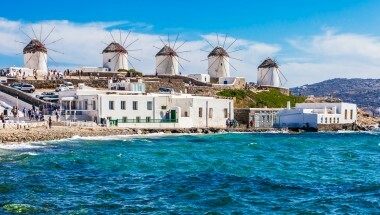 Mykonos Town is 10 minutes away. The villa has been designed and built with respect to the rocky environment and the culture of Mykonos. The interior decoration is the result of the owner’s travelling experiences worldwide, with the selected objects and pieces of art harmoniously blending with the simple Cyclades architecture and smooth lines. The wide terraces, from where the spectacular views can be enjoyed, offer both shaded and sunny areas for relaxing outdoors, and an infinity swimming pool. There is also an outdoor dining area with built-in barbecue, a Brazilian hammock, and a yoga/meditation area. The accommodation (375 m2 ) is on three levels with four bedrooms on the lower level, as well as a playroom with ping pong table, a laundry room and a garage. The main living area with indoor dining room and fully equipped kitchen is on the pool level and the master bedroom, with fireplace and opening to two terraces, is on the first floor. Amenities include Wi-Fi internet, satellite TV, indoor sound system, air conditioning and ceiling fans in all bedrooms. There is also a shower room by the swimming pool. Triple bedroom with en suite bathroom. Double bedroom with en suite bathroom. Twin bedroom with en suite bathroom. All above bedrooms have access to the garden with sea and city view. Single bedroom suitable for nanny or a teenager with en suite bathroom. Playroom with a ping pong table. Laundry room, storage room and garage. Living area with a big window of outstanding view, fireplace. Indoor dining room, fully equipped kitchen. Guest WC. A charming rental villa with spacious terraces and swimming pool, located in Agios Stefanos,with breathtaking views to Mykonos town and the sea. 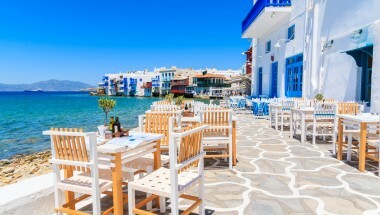 Agios Stefanos beach is just a 3 minute drive away, and Mykonos Town is 10 minutes away.